In 8-inch nonstick skillet, melt 2 tablespoons of the butter over medium heat. Stir in bread crumbs; cook 6 to 8 minutes, stirring constantly, until golden brown. Remove from skillet; set aside. Cook and drain gnocchi as directed on package. Meanwhile, in 2-cup glass measuring cup, mix milk and whipping cream. In 4-quart or larger Dutch oven, melt remaining 2 tablespoons butter over low heat. Add garlic; cook about 30 seconds, stirring frequently. With whisk, stir in flour and salt until smooth. Increase heat to medium; cook and stir until mixture is smooth and bubbly. Gradually stir in milk mixture. Heat to boiling, stirring constantly. Boil and stir 1 minute; reduce heat to medium. Stir in fontina, Cheddar and 1/4 cup of the shredded Parmesan. Cook until melted, stirring occasionally. Stir gnocchi into cheese sauce. Remove from heat. Pour mixture into baking dish. Sprinkle bread crumbs and remaining 1/4 cup shredded Parmesan over pasta mixture. 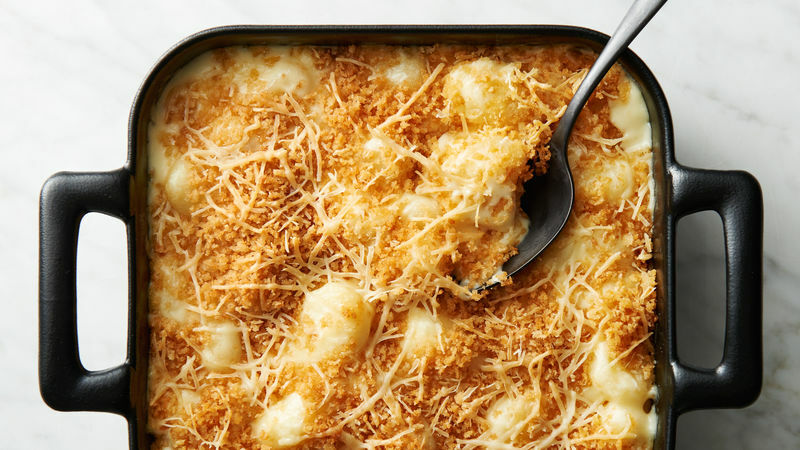 Bake 20 to 25 minutes or until bubbly around edges and cheese is melted. For a different flavor, try all fontina or all white Cheddar cheese with the Parmesan in this recipe. Premade gnocchi can be found in the pasta section of the grocery store.